In the coming years, Chinese plan to carry out several extremely interesting and complicated space missions, the ultimate goal of which will be to bring samples from Mars to Earth. First, however, it will be necessary to send a similar mission to our natural satellite. The Chinese Lunar Exploration Program started on 24 October 2007, when the Chang'e 1 probe was sent to the lunar orbit. Thanks to the data collected by the orbiter from November 2007 to July 2008 it was possible to create the most accurate 3D map of the Moon's surface in the history. The mission also succeeded in mapping the distribution of many elements in the lunar soil. Initially, the mission was planned for one year, but was extended by four months. Finally, the probe was crashed on the surface of the Moon on 1 March 2009. The next step was to send another orbiter Chang'e 2 in October 2010. This time the ship was equipped with a slightly better camera than its predecessor. The probe entered lunar orbit in just 5 days, using a stronger version of the rocket, which enabled a direct flight towards our natural satellite without entering the Earth's orbit. During the mission, it was possible to descend to a height of just 15 km above the surface, which allowed for an accurate photographing of the future landing site of the Chang'e 3 mission. After studying the Moon, Chang'e 2 went to the Lagrangian point L2 in the Earth-Sun system. This allowed the Chinese tracking and communication system to be tested. After this, the probe was directed towards asteroid 4179 Toutatis. During a fly by only 3.2 km away, it was possible to photograph the surface of the asteroid at a resolution of 10 m/px. Since then, the probe has travelled further away and is now more than 200 million kilometres from the Earth. This allows further testing of the Chinese communication and control system in deep space. Then came the time for a mission, which main objective was to land on the lunar surface. On 1 December 2013 the Chang Zheng 3B (Long March 3B) rocket with the Chang'e 3 mission was launched with a lander and a 140 kg Yutu rover. Several devices have been installed on the lander. One of them was the Lunar-based ultraviolet telescope (LUT), a telescope used to observe deep sky objects in the near ultraviolet band. Another element was a camera used to observe the plasmasphere in the extreme ultraviolet band. On the lander there was also a place for a panoramic camera and a probe allowing to examine the soil. 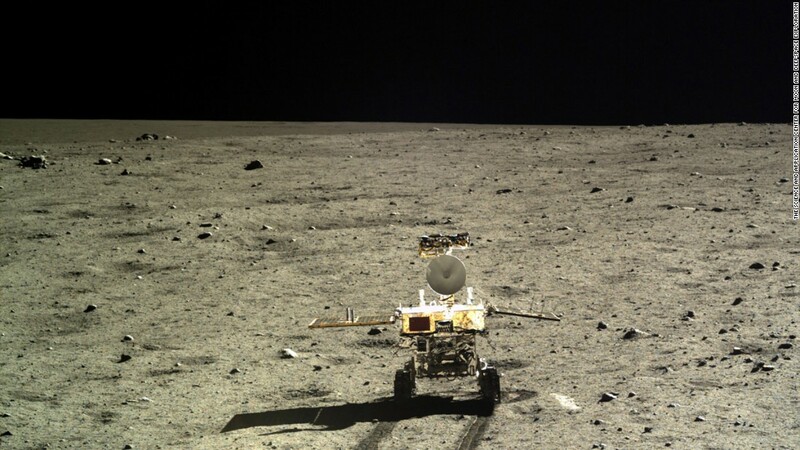 The Yutu rover was equipped with, among others, several cameras and a ground-penetrating radar, which allowed to study the soil up to a depth of 30 m. Both the rover and the lander were equipped with radioisotope thermoelectric generator, which allowed to heat the devices during 14-day lunar nights, when the vehicles were put into sleep mode. Missions Chang'e 1-3 have shown that the Chinese are able to place probes lunar orbit and safely land and conduct research on the surface of the Silver Globe. The next mission of Chang'e 4 will be to land again on the Moon, but this time on its far side, invisible from the Earth. If everything goes according to plan, China will be the first country to do so. In order to communicate with the lander and the rover, it will be necessary to use a satellite placed behind the Moon to transmit the signal to the Earth. All these experiences will be applied during the planned Chang'e 5 lunar sample-return mission. Initially, the mission was planned for 2017, but due to the failure during the launch of Chang Zheng 5 (Long March 5) rocket in July this year, it was decided to postpone the mission until 2019. After a soft landing on the surface of the Silver Globe, the probe will use a drill to extract basalt sample from approximately 2 m, the age of which is estimated to be 1.3 billion years. It will be the first mission since 1976 to bring samples from Moon to Earth. Contrary to similar Soviet missions, however, the Chinese are planning to dock with the return module in the lunar orbit before returning to Earth. A total of 2 kg of samples should be transported to Earth. The next step will be to send mission to Mars. In 2020, China is planning to launch an orbiter, lander and a rover to the Red Planet during single rocket launch. The objective of the mission will be to investigate martian soil, to search for water ice, to assess habitability of the planet, to investigate the atmosphere and to track the weather. The orbiter will also be equipped with a camera, which will allow for high resolution (50 m/px) imaging of the planet's surface. This data will be used to select a landing site for a Mars sample-return mission. This mission is planned for the end of the 2020s, although it has not yet been finally approved. The whole thing - delivery of the devices to Mars, launch, landing, taking samples, taking off from the Mars surface, docking with the return module and finally returning to Earth - would be done with the use of a single launch of the Chang Zheng 9 (Long March 9) rocket whose maiden flight is currently scheduled for 2025. For several decades scientists from different countries have been trying to conduct Mars sample-return mission. The Russians were planning to do this already in the 1970s, but the repeated failures of the N-1 rocket, which would serve this purpose, have made these plans impossible. NASA and the European Space Agency also planned a joint mission of this type. It was to take place in 2018-2022, but eventually NASA withdrew from the project, which meant that the mission was postponed to an unspecified date. NASA has recently announced that it is considering sending a mission of this kind in 2026, when a rover would be sent to Mars to take samples collected by another rover, Mars 2020, which will arrive at the Red Planet in 2021. For the time being, however, nothing is certain on this subject. It may turn out that it will be the Chinese who are the first to successfully return martian samples to Earth.